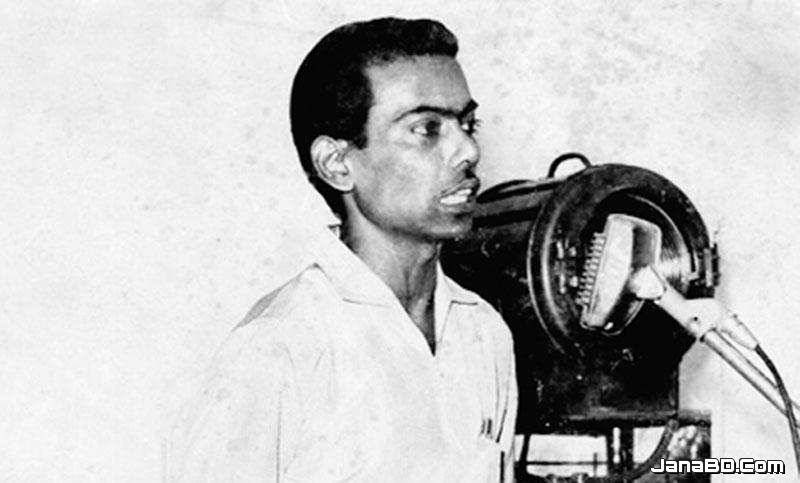 Zahir Raihan was one of the most talented film makers in Bangladesh. He was born on 19 August 1935 in the village Majupur, in Feni district. He was an active worker of the Language Movement. He was one of the ten students to go out in a procession on 21 February 1952 despite a ban on such activities. As a result, he and many others were arrested and taken to prison. Zahir was also present at the historical meeting of Amtala on February 21, 1952. He also took part in the mass movement in 1969. In 1971, he joined the Liberation War. All through his life, Zahir dreamt for a democratic society, a society that will ensure freedom of speech and will. He had many dreams about our film industry too. He made a legendary film ‘Jibon Theke Neya’ based on the Language Movement of 1952. It was a revolt against the then autocratic government. The family presented in that film was a miniature East Pakistan ruled by an autocrat who had to go to the prison for her conspiracy. During the liberation war this film was shown outside Bangladesh. Critics like Satyajit Ray, Mrinal Sen, and Ritwik Ghatak appreciated this film. Zahir gave all his money to the Freedom Fighters’ trust that he got from his film shows. Besides, his great documentary on Pakistani atrocities, ‘Stop Genocide’ helped create world sentiment in favour of our liberation war. On 30 December 1971, someone informed Zahir about an address somewhere at Mirpur, where he might find his brother, the famous writer Shahidullah Kaiser. Shahidullah was captured and killed by the Pakistani army and the local collaborators during the last days of the war. Accordingly Zahir left home to get his brother back and he never returned. Zahir’s dream was fulfilled. He could see the inception of a free independent Bangladesh though he did not get back his brother. And it’s a pity that this dreamer was missing at such a time when his dream came true. a) Zahir Raihan was born in ¾ century. b) Before participating in Liberation War he also took part in ¾ movement. c) Which one of the following doesn’t get hindrance in a democratic society? d) What do you understand by the phrase - ‘a ban on such activities’? e) Which one of the following can be treated as appropriate about Zahir Raihan? g) Zahir Raihan left home in search of his brother but never returned ¾ .
a) Where is the place of birth of one of the most talented film makers in Bangladesh? b) How did Zahir Raihan contribute to the language movement? c)Why did the critics appreciate his film shown during the liberation war outside of Bangladesh? d) What was the reason for his leaving home on 30th December 1971? e) Who was responsible for the eternal departure of his brother? a) Majupur in Feni district is the place of birth of one of the most talented film makers in Bangladesh. b) Breaking the ban and taking active part in the procession of language movement, Zahir Raihan contributed to the language movement. c) The critics appreciated his film shown during the liberation war outside of Bangladesh because that creative act revealed the perfect portrait of tyranny and suppression of the country of that time. d) The reason for his leaving home on 30th December 1971, was finding out his missing brother Shahidullah Kaiser somewhere at Mirpur. e) The Pakistani army and the local collaborators were responsible for the eternal departure of his brother. May Day or International Workers Day is observed on May 1 all over the world to commemorate the historical struggle and sacrifices of the working people to establish an eight-hour workday. It is a public holiday in almost all the countries of the world. Since the Industrial Revolution in the 18th and 19th centuries in Europe and the US, the workers in mills and factories had been working a long shift, fourteen or even more hours a day. On May 1st in 1886, inspired by the trade unions, half of the workers at the McCormic Harvester Company in Chicago went on strike demanding an eight-hour workday. Two days later, a workers’ rally was held near the McCormic Hervester Company and about 6000 workers had joined it. The rally was addressed by the labour leaders. They urged the workers to stand together, to go on with their struggle and not to give in to their bosses. Just at this moment some strikebreakers started leaving the meeting place. The strikers went down the street to bring them back. Suddenly about 200 policemen attacked them with clubs and revolvers. One striker was killed instantly, five or six others were seriously wounded and many of them were badly injured. The events of May 1, 1886 is a reminder that workers will continue to be exploited until they stand up and speak out to gain better working conditions, better pay and better lives. (e) ¾ and standard form of life to lead.